NBA free agency is now just hours away, and Cleveland Cavaliers fans remain hopeful the team can pull off some sort of move which makes the team significantly better. 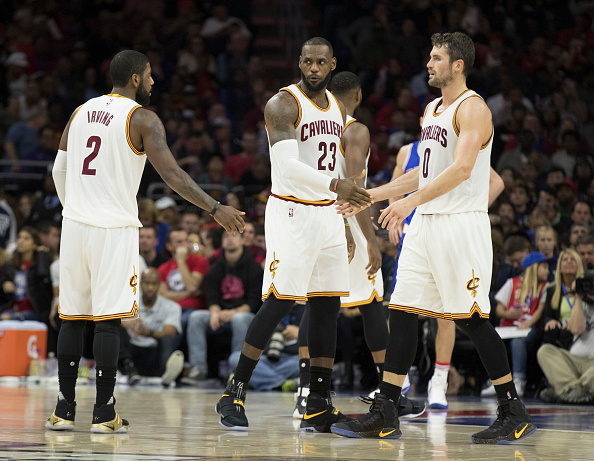 Leading up to the summer spending bonanza, the names associated with the Cavs have remained consistent. Cleveland reportedly has its eyes focused on the Big Apple, hoping the New York Knicks and Carmelo Anthony can agree on a buyout so it can sign him on the cheap. There’s faint hope the Chicago Bulls take the same route with Dwyane Wade. The Cavs also apparently remain hell-bent on acquiring Indiana Pacers star Paul George. Of course, Cleveland’s limited amount of assets has made any game-changing deal tough to come by. If it wants to bring back superstar talent, it’ll have to part with superstar talent. As a result, Kevin Love and, as of last night, Kyrie Irving are seeing their names pop up in the rumor mill. There’s been so much speculation about Love specifically that many feel it’s almost a foregone conclusion he won’t be with the Cavs next season. Because of how divisive he is among fans, many Cleveland supporters are embracing the idea of Love playing elsewhere. Some are even talking themselves into Irving being expendable. For said people, I just want to bring up a quick thought – there are very favorable odds both Love and Irving are back with the Cavs next year. It also needs to be stated this wouldn’t be a bad thing. First of all, those who’ve long thought Love and Love alone could bring this team a better player are quickly learning how wrong said belief was. The market for Cleveland’s stretch forward just isn’t that strong, as the Pacers are never going to see a Love-for-George deal as any sort of win. On top of this, Love would have to be a piece of the puzzle, not the sole prize. When it comes to that, the Cavs don’t have much else to offer. Turns out nobody is banging down the door to acquire Iman Shumpert or Channing Frye. Toss in the fact Cleveland doesn’t have a first-round pick until 2021, and the team is basically beating its head against a wall trying to find a way to turn Love into George. When it comes to Irving, the rumors aren’t as frequent. They’re out there, but he seems to be slightly more untouchable than Love. That said, while the market for Irving would likely be much more active, even considering moving him brings us to one of the more important reasons why I believe he and Love aren’t going anywhere. The Cavs have to look at any deal involving one of these two and consider an incredibly important question – does what we’re getting in return make parting with a very talented player worth it? If trading Love or Irving doesn’t make Cleveland a better team, the move can’t be made. The goal is to catch-up with the Golden State Warriors, not lose a step to them. The Cavs can’t just trade one of these two for the sake of doing it. Unless they can find a way to become a better team by way of making a move like this, they need to stand pat. For those who’d be upset about this outcome, unimpressed with Cleveland’s inability to keep up with the Warriors, please note this scenario wouldn’t necessarily be a bad thing. For as much grief as he gets whenever he puts forth a bad game, Love is still one of the Cavs’ best players. He provides the kind of shooting that can clear space in the paint, and his rebounding ability is by far one of his most overlooked skills. Likewise, despite Irving’s tendency to stop the ball and dribble possessions away, he’s still one of the best play-makers in the NBA. He’s also proven more than capable of taking some of the scoring burden away from LeBron James. So, as desperate as fans are to see Cleveland pull off a blockbuster, do know that returning the same starting lineup which just got to the NBA Finals isn’t a worst-case scenario. If the Cavs do nothing but find ways to upgrade their bench and find a few role players this summer, that’s not a travesty. At the end of the day, said scenario remains the most likely. Just know it also wouldn’t suddenly take away this team’s ability to contend.